This pattern was really intimidating before I actually sat down and started it, and as you can probably tell by how quickly this sock is coming along, I'm not having any problems with it at this point. The pattern itself is fairly intuitive. Essentially it's a P1 K1 tbl rib, with a K2tog that "moves" from right to left for the first half of the chart, and then for the second half the YO moves from left to right. That probably makes it sound a lot more complicated than it is; the truth is, after the first pattern repeat, I pretty much found myself at the point where I didn't really need to look at the chart except to keep track of the number of rows. 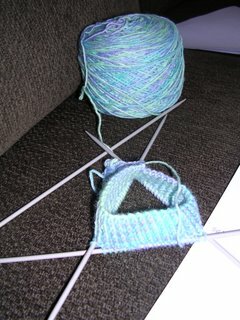 I can't wait to see how the foot of this sock takes shape. I'm thinking once I finish the socks, this patterning might make a really gorgeous shawl. I know I could just do a long rectangle, but I'm wondering if there might be a way to adapt this to a triangle. Any ideas? That's right -- socks, and nothing but. Progress continues on J's Fancy Socks. I'm more than half done with the leg of the first sock, and I'm planning on eliminating about 10 rows on this portion since I'm worried about running short on yarn. 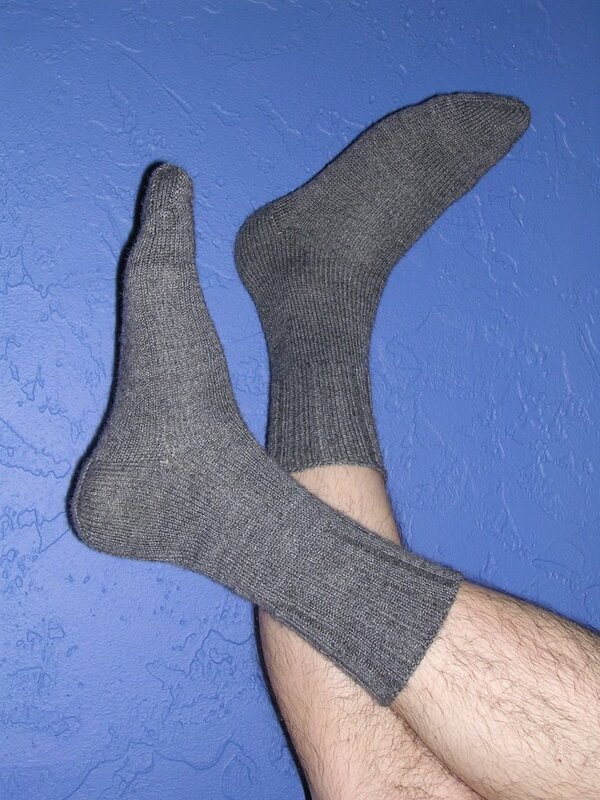 The pattern makes a particularly long leg portion anyway, so I don't think it will make a difference in how the sock looks. This mod will result in eight pattern blocks (rather than nine) in the leg, and the called-for seven pattern blocks in the foot. I've also started another pair for me, and for these I've decided to tackle the Pomatomus (it's taken me all day to learn how to spell that!). I've also caved and joined the Pomatomus Knit Along, which frankly I shouldn't be so worried about because the time frame is really reasonable; I don't think I'll have a lot of trouble finishing these by the fall (although now I've probably jinxed myself). Here's the progress so far, which isn't much, but does show off the beautiful colorway of my Lorna's Laces. 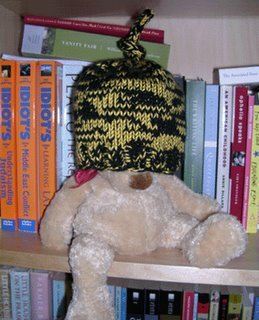 Mods: I did five rows of K2P2 ribbing for the brim rather than the stockinette roll brim the pattern calls for; this hat is for Steelers games, and I wanted it to stay down to cover the little 'un's ears from the cold Pittsburgh winter weather. This hat is also a lot stiffer due to the doubled yarn. I only have to assume that will make it warmer. The recipient of this hat will presumable fill it better than the model. I just want to wash it (since who knows where that black yarn has been or how long it's been sitting in my stash!) before I gift it. A satisfying, quick knit, but it was hard on my hands. I don't recommend doubling the yarn for a project that doesn't call for it. Notice it fits my foot. Although I don't have photographic proof, take my word that it will not fit J's foot. This is a problem, since these socks were intended for him. I followed the pattern faithfully (it's Gentleman's Fancy Sock from Nancy Bush's Knitting Vintage Socks), but it was on size 0 needles, and I think I've determined that I knit too tightly to get it to be the size intended. Frustrating, but not a complete disaster. I'd ordered three skeins of this color to begin with, and the one sock used less than a full skein, so there should be enough (I hope) to complete two more socks for a full pair for J -- this time on size 1 needles! I doubled the cast on yarn for a stretchier cuff, and am now knitting away on two circs, which are oh so much faster (and easier on my hands) than the metal US 0 dpns I used for the first one. Finally did you see who left me a comment on my last post?! Omg, I am still in shock. 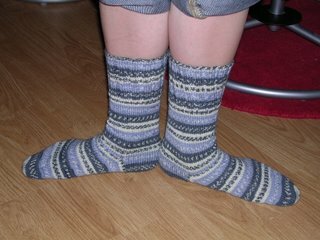 :-) So, Laurie, in case you happen to stop by here again, I'll spill the secret to socks with matching stripes: use self-striping yarn, and start both socks at the same point in the striping pattern (I started in the middle of the white stripe, at the faux fair isle part). This is a whole lot easier if the striping pattern is fairly simple, and the pattern has to be regular and repeating. Non-knitters are really impressed by stripes, especially if they match, and the self-striping yarns make it so easy to impress! Mods: As with J's socks, I grafted the last 14 stitches of the toe to finish. J and I returned yesterday evening from a very busy and very fun weekend in the D.C. area. Lots to talk about -- and lots of pictures to go with! -- so I'll start at the beginning. Aren't they adorable? Sucette (right) is a total diva and has a tendency to shove Yoda out of the way, especially if there's a new person in the house who might show them attention. 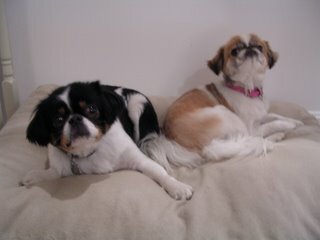 Yoda (left) is on the shy side, and is especially freaked out around men, so he was a little wary of J. The poor guy has a neurological disorder and as a result does not have the best balance, so he'll do things like try to scratch himself with a hind leg while standing and just fall over. It's funny but sad at the same time. He's very sweet, though, and I definitely bonded with him this weekend. Saturday we woke up ready for a good brunch and a chance to see the famed cherry blossoms (this weekend was actually the close of the annual Cherry Blossom Festival). Unfortunately the weather decided to not cooperate with us. It was moderately warm and very muggy in the morning, and over the course of the day it got windier, colder, and more rainy. Any cherry blossoms that were left -- which, we were informed, was not many due to a strong storm earlier in the week -- were pretty much doomed. So we had a lovely brunch at Kramerbooks & Afterwords with some friends who live in D.C. and then the three of us (me, J, and our host) headed over to the Spy Museum, where I randomly ran into one of my high school classmates, who now works there. The Spy Museum was very interesting and a lot of fun, but way too crowded to really get to see everything. I had at least half a dozen people literally walk into me, and spent a lot of time dodging wild children (um, parents? where are you?). After temporarily loosing J in the Spy Museum gift shop (he was in the toy section), we took the Metro over to Union Station, with the idea that we'd walk from there over to the Library of Congress, because J wanted to see the Declaration of Independence. We stopped there for some drinks and to take a little rest. Of course I took this opportunity to whip out my sock, which I'd made really good progress on in the car before it got too dark to knit. Here's a shot of said sock, with a little Union Station ambiance in the background. We made it only as far as the street in front of Union Station before we decided that we were just being nuts to try to walk all that way in the blustery weather and turned around to go back to the Metro. It was just too cold and too wet, and we were all feeling miserable. Instead, we hopped back on the train and got off at King Street in Old Town Alexandria, where our host was sure she'd seen a yarn store. We managed to find a free bus that circles through the area on the weekends -- best of all, it was heated! -- and took it to Knit Happens, an adorable knitting shop that had a great selection of sock yarn, which was exactly was I was looking for, specifically some red (aka, real red) sock yarn for socks for J, because he had decided on the way in that the yarn I was using on his new socks was too dark. We found some really red (think maraschino cherry red) Lorna's Laces that he at first loved, but then about five minutes later decided was too bright and told me to put back. 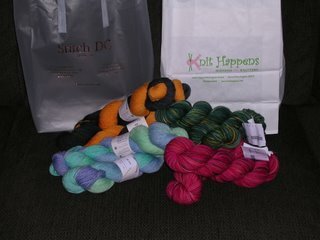 So I shopped exclusively for myself, purchasing two skeins of Lorna's Laces Shepherd Sock and four of Koigu KPPPM (pictures below). We won't discuss what that sent me back. We returned to our host's house to dry off and I got a chance to visit with a friend from college, who very nicely drove over to hang out for a couple hours. The dogs really liked her, and proceeded to wrestle each other into her. J and our host, meanwhile, had gone to Safeway to buy everything to make a scrumptious dinner that night, which we enjoyed with some other friends (ironically, all native Pittsburghers). By the time we woke up on Sunday morning, the nasty weather had passed. It was gorgeous and sunny, blue sky with not a cloud in sight, although still rather chillly (mid-40s). We drove into Georgetown to meet up with my childhood best friend and her boyfriend, and her sister and her boyfriend, for brunch, after which we walked around a bit and enjoyed the sunshine before getting into the car for the ride home. We discovered another yarn store, Stitch DC, about two blocks from the restaurant. It was on the small side, but very cute and the people were very friendly, and I found some must-have Lorna's Laces (see picture below). 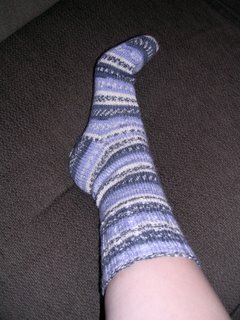 I also cast on for sock #2 and got about an inch done on that before going to bed. Despite the not-so-perfect weather and all the driving and hassle that's involved in a weekend trip, J and I had a lovely time. Our host was so wonderful and really made us feel at home, and it was great to be able to see so many friends, some of whom I hadn't seen in a really long time. Here you see four skeins of Lorna's Laces Shepherd Sock, two in a colorway called Bee Stripe (destined to be a pair of Steelers socks come football season) and two of a colorway called Georgetown -- ironically, not the color I bought at the store in Georgetown! It's a little more colorful/bright than I'd normally buy, but I thought the name made it a souvenir (which is of course how I justify the purchase!). Here are also four skeins of Koigu, which I'd been specifically looking for as I've never knit with it before. One colorway is mostly woodsy greens with a bit of yellow, and the other is shades of rose and pink, with a bit of peach and a bit of a maroon-y brown. Again, we're not discussing how much I actually spent on all this; let's just say that these four pairs of socks will probably be the most expensive socks I will have every owned. But at least my feet will be comfortable! 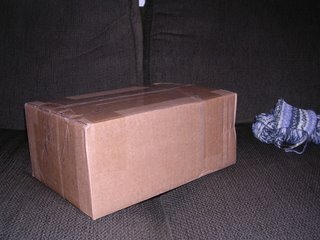 My frogged, restarted, and lately neglected sock wonders, What's in the box? Take a look at this fantastic package! Here you see yummy smelling shampoo and conditioner, a pair of sock slippers with SHEEP on them(! 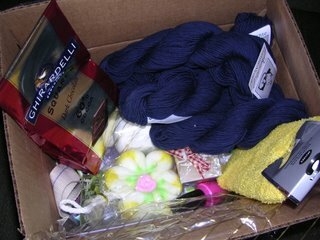 ), a bath pouf in the shape of a flower, OPI nail polish (color: La Paz-itively Hot), a cute little candle with a quilt square motif, four skeins of Classic Elite Mistral (15% baby alpaca, 85% pima cotton), a package of Ghirardelli 60% cocoa dark chocolate squares, and an adorable tote bag that'll be just perfect for carrying my knitting for the car trip to DC this weekend! All this wonderful stuff was courtesy of my fantastic Pampered Pal, Wendy, who also included a note on a knitting notecard (where did you find those? they're so cute!). Thanks, Wendy, you just made my day! In spite of the fact that I have been knitting the better part of my life, I still have that occasional beginning knitter (aka "what was I thinking?!") moment. 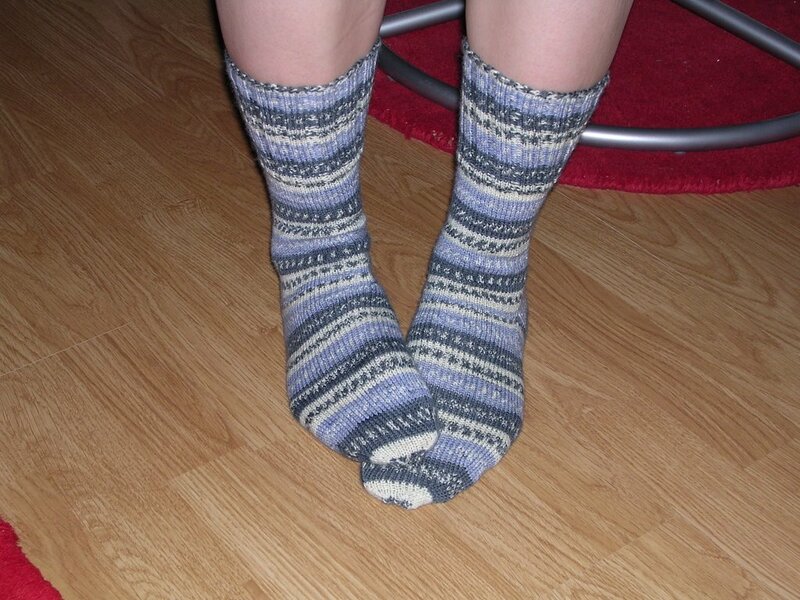 Case in point: my Lady's Plain Winter Socks. 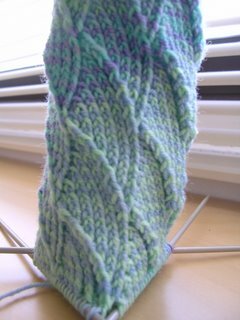 There I was knitting along speedily, a few rows into the heel flap, when I decided I'd like to try the sock on to see how pretty it looked on my foot. Big uh-oh -- it was waaaaay too tight. 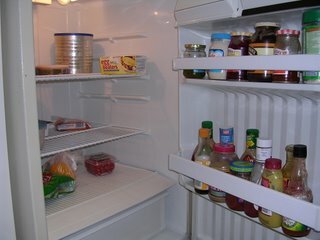 Where did I go wrong? 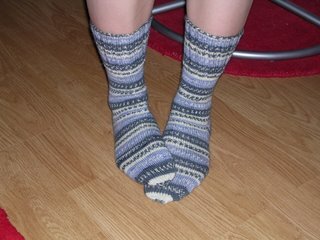 You guessed it; I neglected to double my yarn for the cast on to make it stretchy enough to fit around my calf, in spite of the fact that I'd just done it correctly for both of J's socks. Big time "D'oh!" moment. 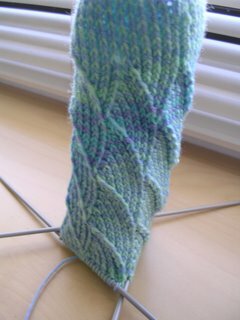 So while waiting for the bus I completely frogged my 9+ inches of pretty Storm sock. Trust me, I got some funny looks while doing that. I re-cast on (correctly this time!) last night and got about three inches done by the time I had to leave for work this morning. Everything was going well, and then what did I do? I left my knitting on the couch. In my apartment. When did I discover this? About 30 seconds after I got on the bus this morning, when I reached in my purse to pull it out for some productive bus knitting. Grrrr. 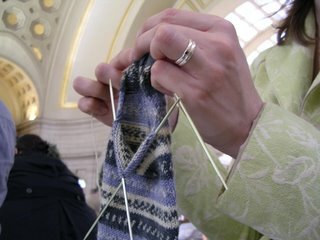 So, until I've made up all that lost knitting time and have something resembling a sock to show you, I'll just post this picture from the Knit Picks site that shows the colorway. Obviously my sock looks a little different, but you get the idea of the colorway. Looks like these socks will be going to D.C. with us this weekend. Who knows -- maybe your first sight of them will be with a famous monument or a famous politician! 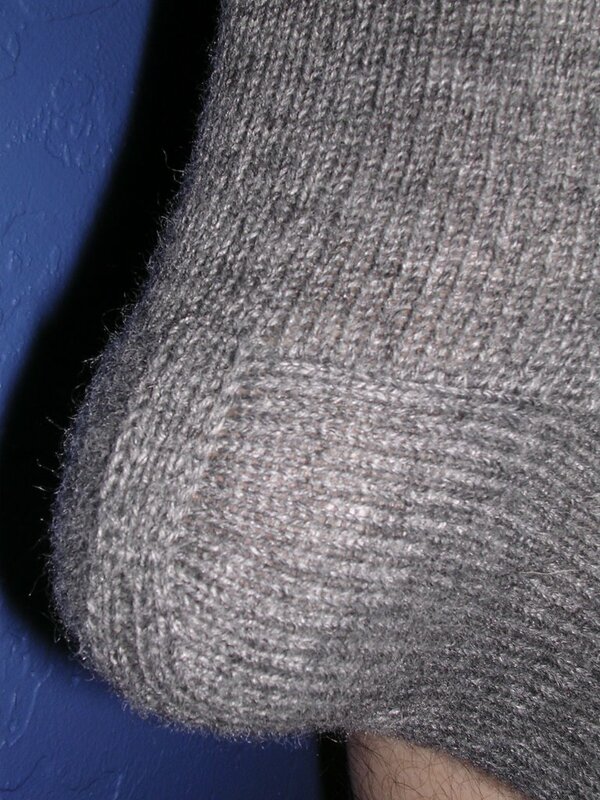 Here's a detail shot of the heel and its ingenious construction. 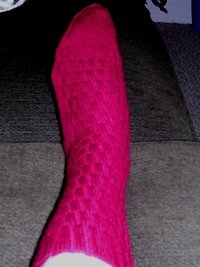 I really enjoyed this pattern, and the "boring" stockinette portions went pretty quickly on two circs. I liked this pattern so much that I've started a pair for myself (I think I'll call them "Lady's Plain Winter Socks") in Knit Picks Simple Stripes in the Storm colorway. 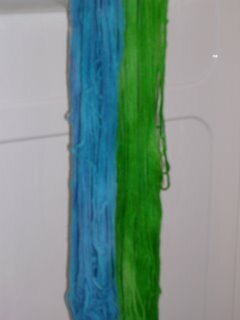 I have to say, it's a much more entertaining yarn than the gray I used for J, and I love watching the stripes change. "Rows 26, 28, and 30: Purl to center st, k1, purl to end." Can you spot the mistake? That's right, it should read: "Sl1, purl to center st, k1, purl to end." ... and here is Kool Aid Yarn Cake. Yummy. 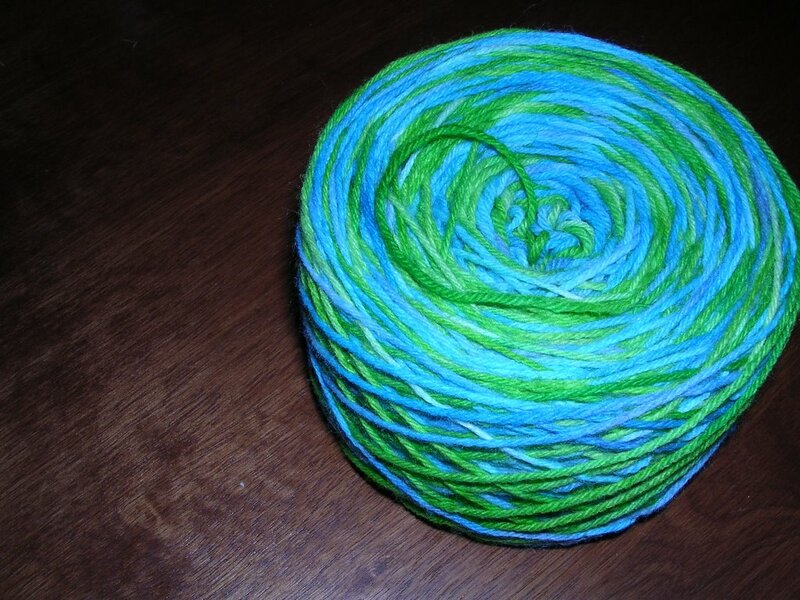 I'm calling this colorway Caribbean Amphibian, or, alternatively, Robin. (I will be very impressed by anyone who gets that reference!) I'm contemplating taking this on our road trip to DC this weekend for my car knitting. I'll have to see just how attached (addicted?) I am to my socks at that point, and I'll have to keep in mind how much room I'll need to allow for stash enhancements from this trip.